This beautiful 8 inch majestic rubber finished golden rooster is stepping on beds of Chinese coins, ingots and ru yi. Chinese coins and ingots are the symbol of wealth whilst ru yi represents Doing Everything Well. It is one of the perfect gifts for the year of rooster. The red ball in front of the rooster represents treasure. Further, rooster is believed that it can prevent gossips and arguments as well as bring good omen and good luck. It is also the feng shui cure to missing corner or protrusion. If the east side of your home is missing, you can display this rooster statue in your east corner as a cure. This golden rooster figurine is accented with one glass base. The Chinese wishing words on the glass are JiXangRuYi which have the meanings of prosperity, power and Doing Everything Well. The dimension of the whole statue is approx. 5.5" x 3.5" x 8" . 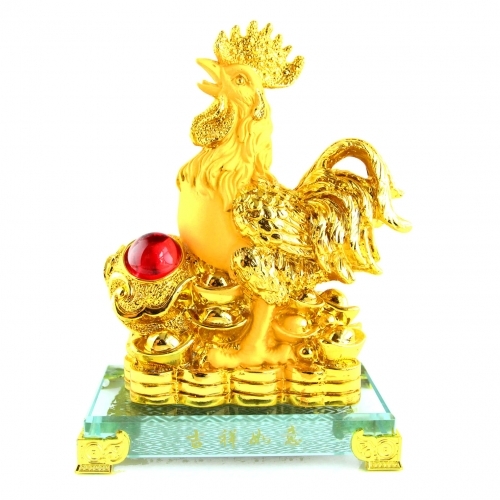 The golden rooster statue and Chinese coin are made of resin and rubber finish.